The Department of General Pediatrics is one of the largest departments in the Hospital doctors of the department are involved with clinical care, teaching, administration and quality management. What is Department of General Pediatrics? The Department of general Pediatrics takes care of your child with extraordinary dedication, skill and expertise care to deal with children’s problems. The team works together flawlessly, with one goal in mind: healing children as quickly and happily as possible. Children with all the routine problems get admitted under our care. Who are the doctors who would take care of my child after hospitalization? 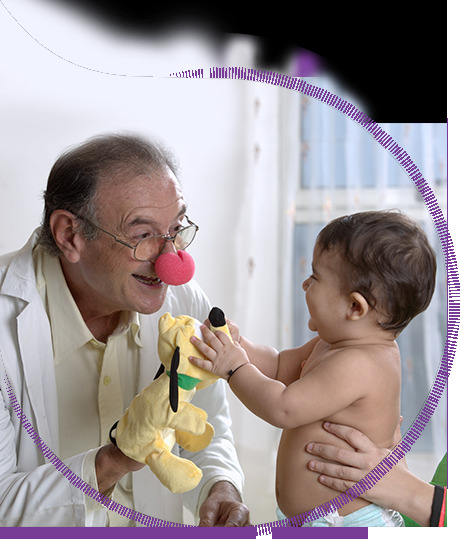 Our doctors are trained in the pediatric specialty and have extensive experience providing care from conception to age 18. The team consists of Consultants, Clinical Associates and Senior Pediatrics Registrars. What if my child requires a Specialty Opinion/Consultation? The team works together and lease’s with different pediatric sub-specialties like cardiology, Haemato-onocology, Neurology, Gastroenterology to Nephrology in case of complex problems and super-specialty consultations whenever required. What is special about the department? We care for the whole family --- and spend time answering questions, listening and taking the time to make treatment options clear and understandable. It's why we're known for our excellence in patient care and why parents throughout the region choose us to care for their Children’s. How much does it cost to have my child admitted in the hospital? For Patients having TPA: The evaluations and medical care provided to your child during hospitalization will be billed to your insurance company in the usual manner depending the type of cover you are entitled to, the TPA desk executives/MOD at the hospital would be available to answer your queries related to this. For Patient Not availing TPA cover; the financial counselor/MOD at the time of admission intimation would brief the approximate expenses. How do I get an appointment set up for my child after Discharge? Upon discharge from the hospital, the floor coordinators will set up an appointment for the child. This information will be relayed to the parent during discharge process. All additional appointments and subsequent follow up visits can later on be managed by calling the appointment desk. What are the clinic hours/OPD Timings? The OPD is open Monday-Saturday, 8am to 8pm. Patients can fix their appointments online or call the appointment desk between 8am to 8pm to fix an appointment. Emergency department at all the hospital branches can be reached for emergency problems where a qualified pediatrician is there to assess and give the necessary treatment. In case of weekends and public holidays patients can seek medical advice by visiting the pediatrician on duty. For timings on weekends and public holidays do call the appointment desk/front desk.